Not a single Norwegain defense minister over the past 18 years was willing to take responsibility at hearings this week into the country’s expensive and deeply troubled NH90 helicopters. The politicians blamed defense officials, who in turn blamed the helicopters’ Italian producer. In addition, reported newspaper Aftenposten, came news that there’s a still a great risk that new problems will turn up around the helicopters. Norway ordered 14 of them back in 2001, eight of which were supposed to serve aboard coast guard vessels and six on Norway’s also-troubled frigates. Only nine have actually been delivered and none are in use as planned. It’s a scandal that’s dogged all of Norway’s governments over the past two decades, led to strong criticism by the state auditor general and prompted hearings this week at the Parliament in an effort to try to determine what went wrong. Defense ministers involved were called in to testify along with top defense officials. None of them was willing to accept blame or responsibility. Aftenposten reported that the politicians representing both Labour- and Conservatives-led governments blamed the defense officials and so-called military experts who despite endless delays clung to the choice of the NH90, which proved to be experimental aircraft. The defense officials including current defense chief Haakon Bruun Hanssen blamed the Italian producer NHI. Their only comfort was that the sole alternative to the NH90 helicopter, the US-made Sikorsky Sea Hawk, was not deemed as meeting Norwegian demands for operations in rough seas and weather in the far north. Defense officials dimissed a comment that the Danish coast guard uses Sea Hawks along the coast of Greenland, with Bruun Hanssen claiming the Sea Hawks still wouldn’t have been acceptable because they wouldn’t be able to float if forced to land at sea. The NH90, meanwhile, was supposed to have served as the new multi-purpose helicopter for the Norwegian defense department. It was developed by four European countries and produced in Italy, but finally delivered with hundreds of flaws and demanding enormous amounts of maintenance. As a result, those that have been delivered have mostly been grounded and unavailable for service. They’re also costly to fly, as much as NOK 260,000 (USD 31,000) per hour. Bjørn Tore Godal, who served as defense minister in the current NATO chief Jens Stoltenberg’s Labour government in 2000-2001, claimed that he’d relied on the recommendation of four other Nordic defense ministers who chose the NH90 at the end of the 1990s. He also claimed he was told that the NH90 was the most cost-effective alternative when Norway’s old Lynx helicopters needed to be replaced. Grete Faremo, who served as defense minister for Labour in a later Stoltenberg government, admitted it was no fun having to inform the Parliament of ongoing delays and problems in taking delivery of the helicopters. The first didn’t land in Norway until 2011, 10 years after being ordered. She did admit that during her time as defense minister, there were no detailed discussions about why there were so many problems. 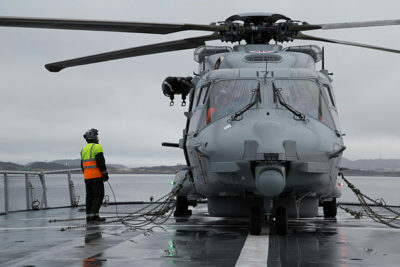 Current Defense Minister Frank Bakke-Jensen of the Conservative Party said defense officials have never asked, though, to drop the NH90s and order other helicopters, again because alternatives were few. Only former Defense Minister Espen Barth Eide considered, back in 2012, dropping them and opting for Sea Hawks like Denmark had done, but that didn’t happen. Norway thus remains stuck with its faulty NH90s. Coast guard vessels have sailed without helicopters since 2014, with the frigates getting priority for any operable NH90s because they must have helicopters to track submarines.